Internet safety is a concern for schools and families, to that end the Parents Association in Cashel C.S invited Dr. Maureen Griffin, a specialist in Internet safety who has extensive experience in this area to make a number of very informative presentations to students, parents and staff over two days. 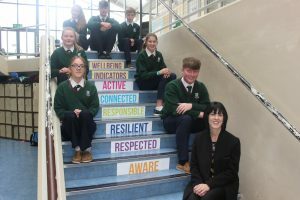 The presentations were overviews of what internet sites and content are currently popular among Irish students and the potential dangers posed by these. She provided practical advice on the protection necessary when online or using mobile devices. Issues such as social networking sites (e.g. Instagram); social messaging/chatting apps (e.g. snapchat); video streaming sites (e.g. YouTube); mobile device safety; screen time; grooming; sexting and cyber bullying were addressed. CCS students with Dr. Maureen Griffin.